I’ve always wanted to share recipes on my blog, but it’s kinda difficult taking pictures while cooking. 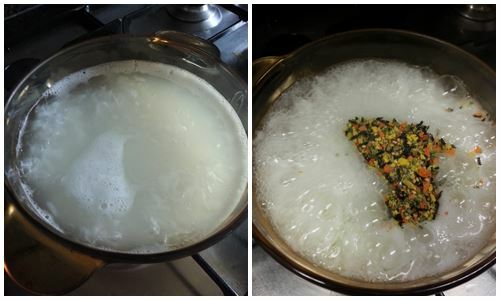 I am a follower of ì´ë°¥ì°¨ on Kakao Talk and that’s where I usually get the recipes for the Korean food I cook at home. I have tried so many recipe sources, but I always get the best results from ì´ë°¥ì°¨. 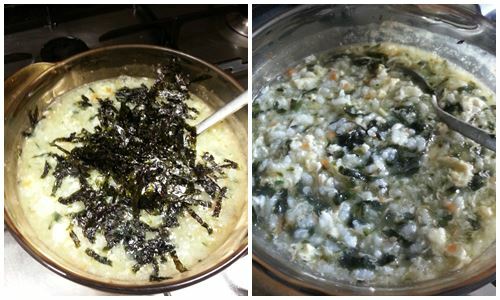 Anyway, this Korean rice porridge is called ê¹€ê°€ë£¨ë‹¬ê±€ì£½ (kim-karoo dal-gyal jook). You can get the “hurikake” and “kimkaru” from the grocery. 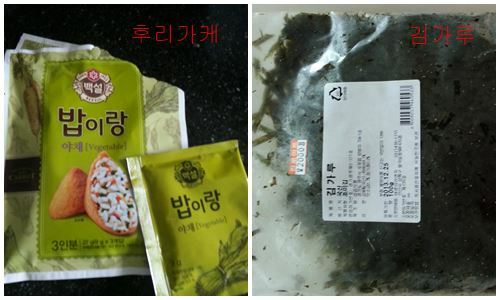 A pack of the “hurikake” contains three envelopes and it costs anywhere from 1,800-3,200 won depending on the brand and the flavor. I usually buy the vegetable and the shrimp variant. I always have a pack of “kimkaru” stored in our fridge. I garnish noodle dishes and fried rice with it. 1. 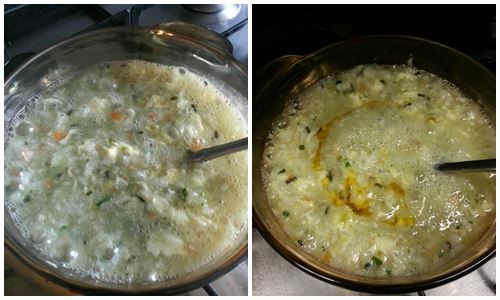 Boil the cooked rice in water for 20 to 25 minutes in medium heat. 2. Add an envelope of the “hurikake” and stir. 3. Beat an egg and pour it in the porridge. 4. Add the sesame oil and stir. This is so easy to make and it’s tasty. It’s almost like the porridge we have at our favorite Korean shabu-shabu restaurant. There is no need to add salt or other seasoning.